He’s easily the most famous peanut farmer in history, and he is now the first president of the United States to be inducted into the Georgia Agricultural Hall of Fame. 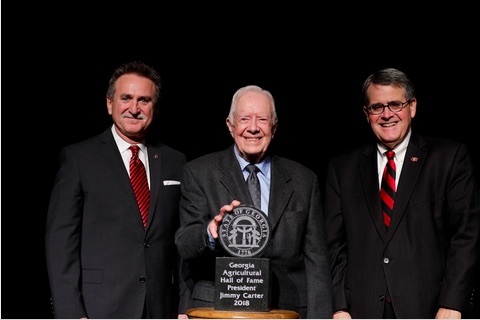 President Jimmy Carter was inducted into the Georgia Agricultural Hall of Fame, housed at the University of Georgia, on November 9 at the 64th UGA College of Agricultural and Environmental Sciences Alumni Association Awards. “This has been the highlight of my life in agriculture, my induction tonight,” Carter told the crowd gathered at the ceremony. The Georgia Agricultural Hall of Fame was established in 1972 to recognize individuals who made unusual and extraordinary contributions to the agriculture and agribusiness industries in Georgia. The University of Georgia College of Agricultural and Environmental Sciences Alumni Association maintains the Hall of Fame. Former inductees include agricultural history-makers such as Tommy Irvin, Georgia's former commissioner of agriculture; D.W. Brooks, founder of Gold Kist, Inc. and Cotton States Mutual Insurance Companies; J.W. Fanning, former UGA vice president for public service and J. Phil Campbell Sr., founding director of the Cooperative Extension Service in Georgia. "Agriculture is a business, and it's a way of life but it's also an act of service to the larger community," said Sam Pardue, dean, and director of the UGA College of Agricultural and Environmental Sciences. "Georgia's Agricultural Hall of Fame is filled with individuals whose impact on agriculture has had generational effects that positively impacted the entire state and country." Carter’s agricultural background helped shape his public service ethic and drove him to help people, said Abit Massey, former head of the Georgia Poultry Federation and a friend of Carter's. Having Carter run for statewide office and then his national post made the nation take notice of what was happening in rural Georgia. More information about Carter’s life as a farmer and his contributions to Georgia agriculture can be found at the Georgia Agricultural Hall of Fame website and t.uga.edu/4xi. In addition to the Georgia Agricultural Hall of Fame ceremony, the CAES Alumni Association honored outstanding alumni during this year’s awards banquet. This year, recipients of CAES Alumni Awards of Excellence include Donya Lester (BSA 1981), executive director of the Purdue Agricultural Alumni Association; Krishna Paudel (PHD 1999), professor and environmental economist at Louisiana State University; Calvin Perry (BSAE 1986, MS 1988), superintendent of the University of Georgia’s C.M. Stripling Irrigation Research Park and Jody Strickland (BSAE 1986), executive vice president of forest operations and real estate services for F&W Forest Products. CAES Young Alumni awards were awarded to Linda Purvis Young (BSA 2002), instructor and academic advisor University of North Georgia; Nick Chammoun (BSA 2007, MS 2009), technical agronomist for Monsanto and Sara Hughes (BSA 2002, MED 2003), Oglethorpe County Middle School agriculture teacher.